Loved this hostel! The staff was super friendly and welcoming. The location is great, and its super easy to get to the main attractions in the city. There are lots of good restaurants and pubs really close to the hostel. It was super clean and the beds were really comfortable. Plus the free dinners are really yummy and a great way to meet other travelers! 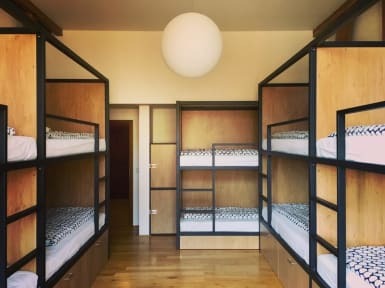 Would definitley reccomend this hostel if you are staying in Prague! Had such an awesome stay at Miru. The rooms were clean as well as the bathrooms. Great storage lockers to fit your luggage. David and Rodrigo were amazing hosts. As a solo traveller they provided the perfect amount of socialness (not a crazy party environment). Location was great, just a short walk from the main attractions. 10/10 would definitely recommend and stay again. Absolutely loved my time in Prague! It was the second time I stayed in a Hostel One after also using one in Madrid and it didn't fail to deliver. The staff were brilliant and the hostel generally was very welcoming! The evening meals are a great chance to meet and get to know people which definitely makes solo traveling a bit easier. Great hostel, atmosphere made it super easy to make friends with the home cooked dinner every night, and the tours and pub crawls helped to explore the city. The staff were all amazing, especially Sophie who helped us find our way around and gave us useful tips on how to have a great stay in Prague. My friends and I really enjoyed our stay at Hostel One Miru. New, modern facilities plus a small, social feel where people enjoy meeting each other. We also appreciated the scheduled events the hostel organized each day, especially the free dinners :). Overall, we loved our time in Prague! Could not recommend this Hostel more - was the highlight of my Euro trip! Huge thanks to David, Maddy, Rodrigo, and Sophie for making it a memorable experience! This hostel set the bar very high! Clean, efficient, and a warm welcoming place. The staff really tries to get to know you and they’ll make every effort to remember your name! This place is set up to encourage a very friendly atmosphere. And the family style dinners are great ice breakers to start new conversations and create new friendships. Say hi to everyone you meet. You won’t regret it. To the staff: keep up the great work!